Collects Death of X #1-4 & Death of X Variants. 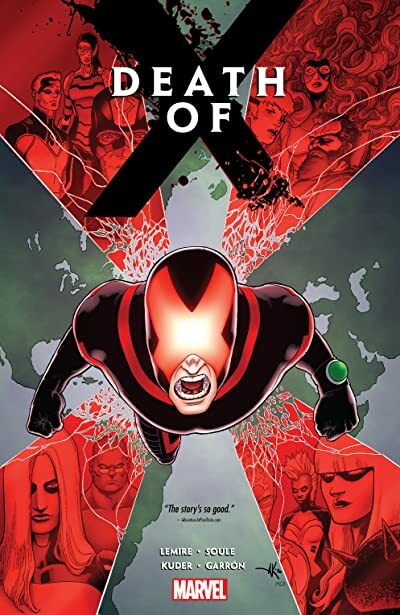 What happened eight months ago that set the Inhumans and X-Men on a collision course? The wait is over — the answers are here! As the Inhumans travel to Japan, where one Terrigen Cloud creates a shocking NuHuman, the X-Men head to Muir Island and find a second Terrigen Cloud causing something truly terrible. When these two events collide, a conflict of catastrophic proportions explodes! While Storm and Medusa come together to seek a solution for the Terrigen's deadly effects on mutants across the world, Cyclops and Emma Frost put their own plans into motion. Lines will be crossed as the first true battle in the Inhumans/X-Men war begins — and Scott Summers won't be the only one who doesn't make it out alive!